Gabbroic outcrops with banding and granitic veining or stoping; field ID only; Le Nez - Le Hocq. Gabbro is a dark grey to black, coarsely crystalline, plutonic, basic igneous rock, rich in Fe, Mg and Ca, low in SiO2 [45-53%]). There are many varieties which variously contain Ca-rich plagioclase feldspars (labradorite to anorthite), Fe, Mg, Ca varieties of pyroxene (augite and hypersthene in tholeiitic gabbros, or titanaugite in alkali gabbros), plus or minus Mg to Fe rich olivine, with accessory hornblende, biotite and interstitial quartz. Many large intrusions exhibit layering, eg. Skaergaard in eastern Greenland, and may occur as lopoliths, eg. the Bushveldt complex, South Africa, or have been intruded as ring complexes, eg. the isle of Skye in western Scotland (Allaby & Allaby, 1990, p. 221). 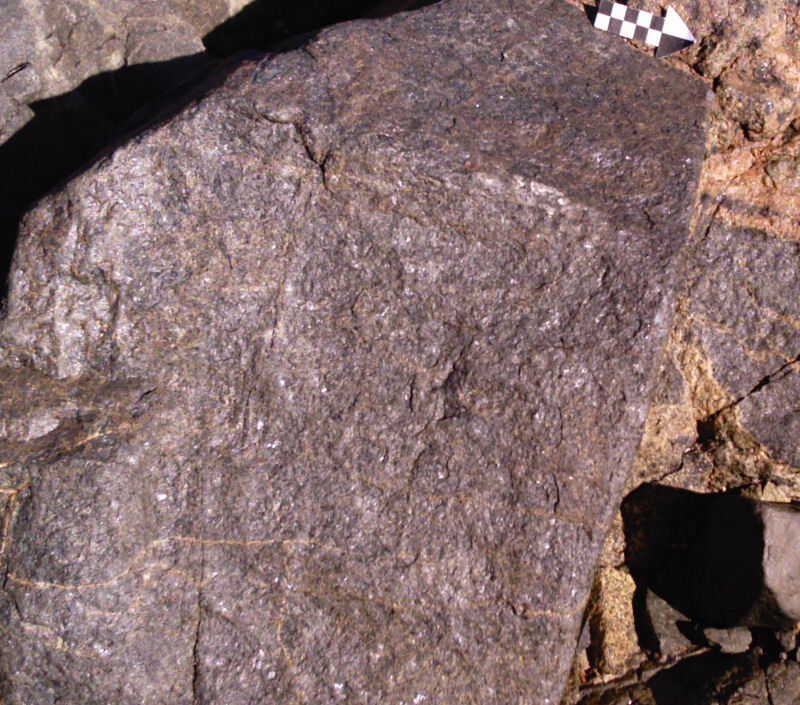 In Jersey, gabbros occur in the SE and NW Igneous Complexes associated with diorites and granites and are considered to be the oldest rocks in the island. They have also been the subject of much discussion about being partly altered to diorites. In the SE Igneous Complex, the gabbros (and diorites) are wonderfully exposed at Le Nez Point and Bishop & Key (1983, p. 921 et seq.) have comprehensively described and illustrated the sequence in which there are various gabbros such as pyroxene-hornblende gabbro and epidotised gabbro which are blotchy, fleck-banded and pegmatitic. They state that... "an unequivocal distinction between gabbro and diorite is not easily made..." (loc. cit. p. 921). The blotches and flecks are dark green and consist of felted masses of chlorite, actinolite, cummingtonite and epidote which though secondary due to hydrothermal recrystallisation, may originally have been Mg-rich olivine or orthopyroxene - not now present (loc. cit. p.929-30). The authors also describe two types of layering; gabbroic and differentiated diorite sheet layering. Both ophitic and poikilitic textures have been described. It is proposed that the alteration was due to metasomatism (the introduction of chemical constituents in to a rock during a volatile phase of metamorphism) accompanying the intrusion of the adjacent, younger granites. By contrast in a discussion, Topley and Brown (1984, p.595) believe that the structures, textures and geochemistry can be explained by primary crystallisation from a dioritic magma. In addition, they find it difficult to accept that gabbros could be recrystallised and melted by volatile-rich fluids at the temperatures existing in the adjacent small granites. Further detailed analysis and a reply countering the theory are presented in the same paper. 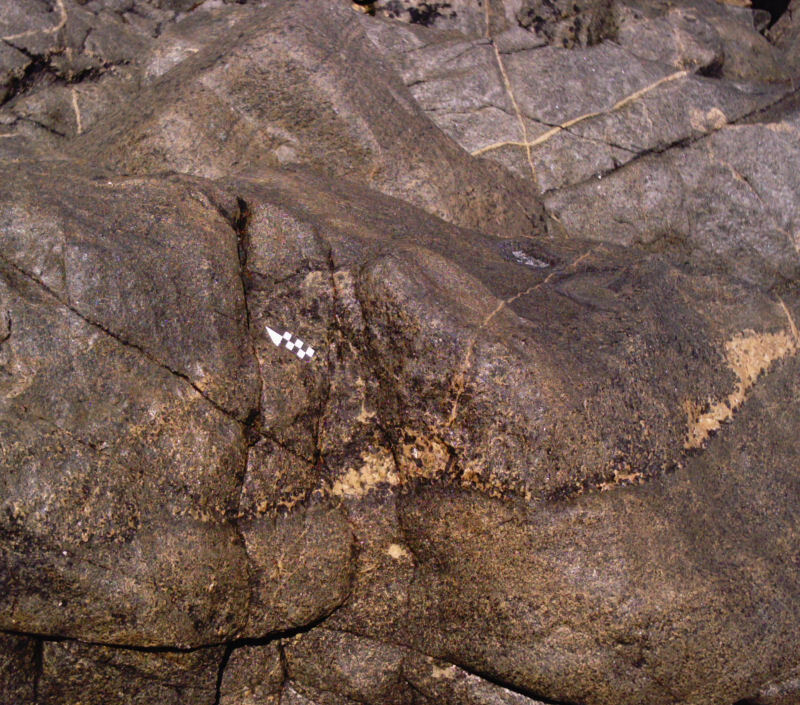 Later in 1989, Bishop & Bisson (1989, p.49)) record that clearly identifiable gabbros have not been found but altered gabbros and hornblende gabbros are exposed along the south coast between Le Nez Point and Le Hocq. The associated layered rocks are diorites which are thought to represent altered layered gabbros. The authors state that... "most of the gabbros have been made over into diorites... (loc. cit. p. 45-6) and later, ..."the gabbroic mineralogy is preserved ... less extensively at Le Nez Point..." (loc. cit. p.46). The gabbros that do exist are layered and dip north eastwards at 70° along with the differentiated sheet layering of meladiorite grading upwards to leucodiorites which the authors suggest developed from gabbroic layering during dioritisation. This has caused the exposed variation from ... "slightly altered gabbro, through hornblende gabbro to diorite and granodiorite" (loc. cit. p. 49). Mela- & leuco- diorites; and gabbro with granite veining (field ID), Le Nez to Le Hocq. At Sorel Point, the gabbros consist of serpentinised olivine, clinopyroxene and labradorite plagioclase feldspar. Different amounts of these cause a layered aspect, with layers dipping at 40° to the south. The olivines have been altered to green hornblendes while the labradorite has become a more sodic oligoclase and andesine with ophitic and poikilitic textures. Zoned feldspars also occur similar to the orthoclase feldspars in adjacent granites (Bishop & Bisson, 1989, p. 46). A more detailed traverse down Sorel Point (Bishop, Keen, Salmon & Renouf, 2003, p. 34-6) over excellent exposures reveals that there are granites, granodiorites, diorites and gabbros. 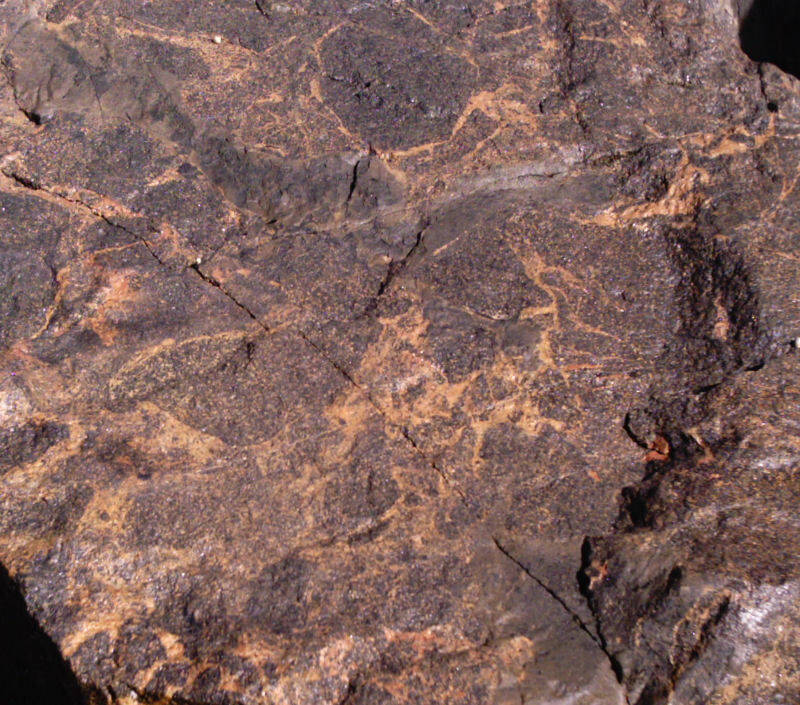 The gabbros are layered and comprise hornlende varieties with poikilitic textures of hornblende around clinopyroxene and plagioclase laths. Relict olivines are reported in thin section. 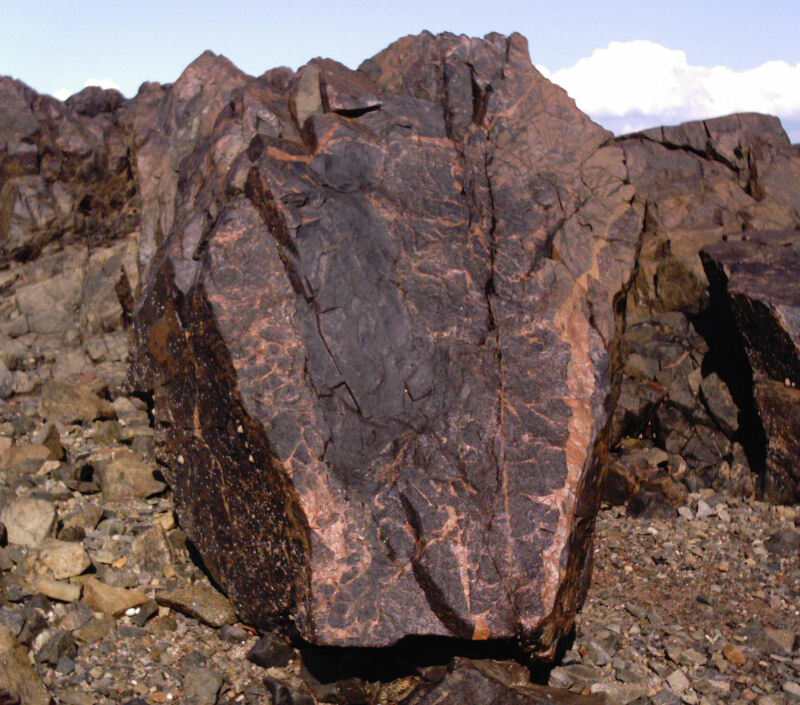 Coexisting magmas gave rise to four separate intrusive rock masses each of two different lithologies; these are fully described by Salmon (1998. pp. 17 - 35). Salmon, S. 1998. The plutonic igneous complex at Sorel Point, Jersey, Channel Islands: a high level multi-magma assemblage. Geological Journal, 33, 17 - 35. Topley, C. and Brown, M. 1984. Discussion on the nature and origin of layering in the diorites of SE Jersey, Channel Islands. J. Geol. Soc. London, Vol. 141, 3. pp. 595 - 596; with reply by Bishop, A. C. and Key, C. pp. 596 - 598.